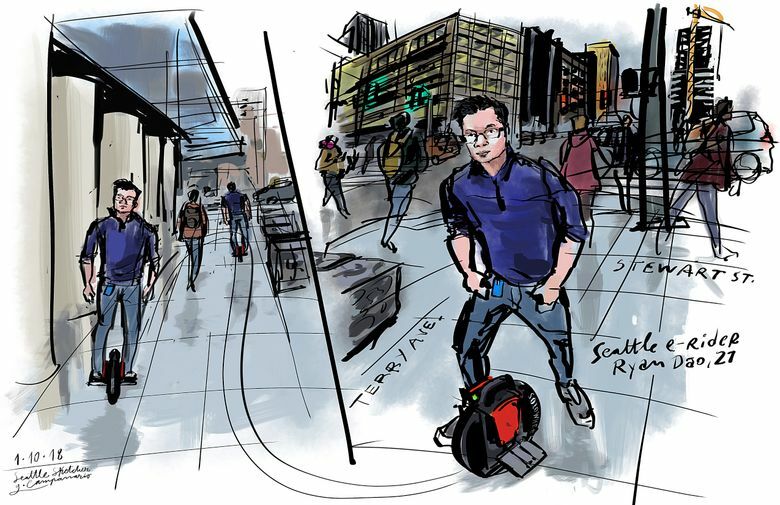 You may have seen people whizzing through downtown sidewalks on all sorts of “e-rideables,” those electric-powered scooters, hoverboards and unicycles also known as “personal transportation devices.” They go so fast but Seattle Sketcher Gabriel Campanario recently caught up with one of these e-riders. It’s been hard tracking one of these e-riders down — they go so fast! But I recently caught up with one at a traffic light and he was happy to meet me later with his $1,000 SoloWheel Classic in front of his office building. Ryan Dao started using an electric unicycle last year to cut down on his commute time. He said it was not feasible to spend 45 minutes each way to go from his apartment on the top of Queen Anne Hill to his office downtown by a combination of bus and walking. The unicycle saves him an hour every day and makes him look forward to his commute, he said. Another plus: It doesn’t take much room in his tiny apartment and requires little maintenance. Dao, a 27-year-old software engineer from Hanoi, said Seattle is well suited for using e-rideables because the sidewalks have lowered ramps at crosswalks. Electric unicycles are also ideal to climb up hills, though he admitted it’s tricky to go down. To learn how to ride, he recommends having someone teach you, and there’s already a Facebook group for Seattle e-riders where people can seek advice. P.S. : I’ll be keeping an eye for e-riders using other types of machines for a future sketch. Are you one of them? Contact me at gcampanario@seattletimes.com.